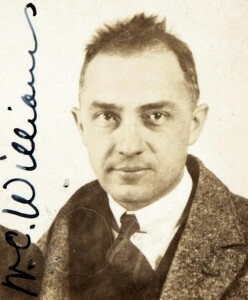 William Carlos Williams (1883-1963) is probably best known for his pared-down, brief poems like The Red Wheelbarrow and This is Just to Say (I have eaten/the plums/that were in/the icebox…), or urban poetic epics like Paterson (he lived most of his life in New Jersey). After an early flirtation with the Imagists – his second volume of poems was published in 1912 with the support of Ezra Pound, whom he’d met at university in Pennsylvania – Williams’ writing style was to change direction towards a more radical modernism; he rejected the highly allusive and multilingual intellectual European style of Eliot, adopting instead a voice that was distinctively American vernacular, with his mantra ‘no ideas but in things’. Williams also wrote prose fiction and non-fiction; one of my tutors at Bristol University, Charles Tomlinson (a British poet who died in August of this year) introduced me to modern American writing, and in particular that of Williams and Wallace Stevens, two poets he admired. He in his turn had an enormous influence on my own literary interests; he’s much missed – a genuinely kind and sensitive teacher. I was interested in following up my reading of another American poet’s prose work, E.E. 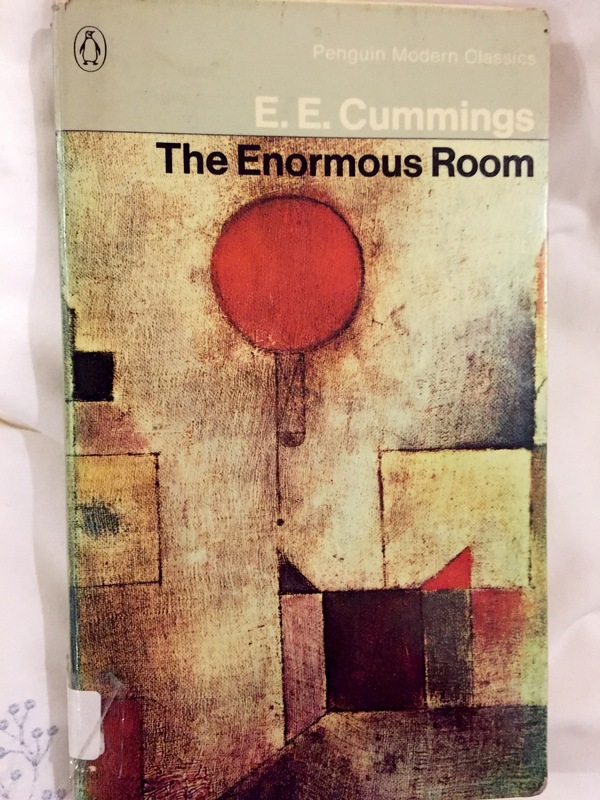 Cummings’ The Enormous Room, about which I wrote here last week, with that of Williams: what sort of novel would this paediatrician-poet create? 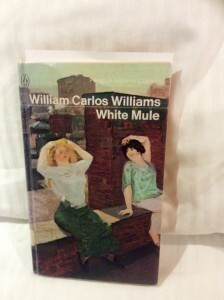 Published in 1937, White Mule was the first in a trilogy of novels about the immigrant Stecher family’s struggle to assimilate in New York City. Its title derives, according to something I read online, but I don’t recall seeing it in the novel, from the baby, Flossie, whose fierce kick is likened to that of White Mule whiskey. She entered, as Venus from the sea, dripping. The air enclosed her, she felt it all over her, touching, waking her. You are too careful, you have no daring, you must bluff! You must. In America bluff is everything…be a better bluff than they are…But you are too timid. I could do it. But now is the time. You have two daughters now and I am not going to sit down and be a hausfrau. I am going to live and see the world and I must have money. And you are going to make it for me…If you think I’m going to stay here and have babies one after the other and nothing else you fool yourself. You tell those people you want more money or quit. If you don’t, I quit. Joe, a printer, was once a firebrand union member, but at the time the novel opens he’s turned gamekeeper, having become disillusioned with the corruption of union officials: as foreman in his printing works he does the owner’s bidding in pushing the workforce to ever greater output with minimal financial reward, taking great pride in his own technical printing skill. The printers eventually call a strike, which Joe resolutely defies and fights, even risking his own life as the hostility grows. But his ungrateful boss fails to recognise his loyalty, and doesn’t even give him a raise when the strike ends. Gurlie is disgusted with him. For a fact the baby liked it immensely in that hot room, if actions mean anything, for it lay completely relaxed on its back, its head moving slowly about as if it were viewing the room though its eyes didn’t seem to focus on anything…The baby was playing up to the girl’s gentle voice and easy manner to perfection. With half closed eyes, it moved first a finger then an arm as if talking some mysterious sign language. By the novel’s end Joe appears to have made a deal with another printer-entrepreneur to start up his own company, a development which will please his driven wife. This is an artistically more ambitious and skilfully realised work than The Enormous Room, with a more artful structure and rounded portrayal of character and relationships. At first I found the abrupt shift of scene from the city to the country farm odd and felt it unbalanced the novel, and the open ending, with an apparently inconsequential rural event, unsatisfactory. On reflection, however, I’ve come to see that it points forward to the next novel in the sequence, and I find I do want to stay with the account of this abrasive, dysfunctional family, which manages simultaneously somehow to persuade me that they’re more than just a force to reckon with – they become a symbol of America’s thrusting, upwardly mobile immigrant-founded citizenry: they’re people who, despite their unattractive selfishness and truculent ambition are credible as flawed, striving human beings. The children were standing back in a fascinated circle, the baby’s face smeared with berry juice, her hands sooty: quite part of it all. She has survived the ordeal of her first year in America and has become ‘part of it all.’ An American. But the cost to Joe has been high as he struggles to maintain his integrity in the face of corrupt unions on the one hand and greedy, corrupt employers – whose number he is about to join in order to get ‘In the Money’ – on the other. We are all, in our diverse ways, immigrants, craving integration and assimilation while maintaining our independence and hoping for our families to flourish. Would Flossie thrive today, I wonder? BBC Radio 4 has a recording of John Cheever’s excellent story ‘Christmas is a Sad Season For the Poor’, read by Martin Freeman – so charming in the Sherlock BBC TV dramas – and available to listen to for almost a month. Highly recommended. Link HERE. You might also want to look up my 2014 review of this story HERE. Bittersweet, like Dickens’ more famous seasonal story. Have read several books recently that I’m hoping to write about here soon: E.E. Cummings, William Carlos Williams, Barbara Comyns among others. Once the holiday guests and visits are departed/completed I might find time to compose some posts. In the meantime I hope you’ve had an enjoyable holiday – if you had one – and have a peaceful, fulfilling 2016. 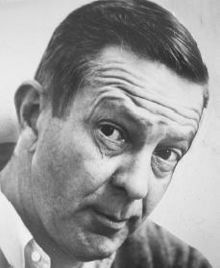 People, says Cummings in his 1932 Introduction to the 1971 Penguin Modern Classics edition of this autobiographical novel first published in 1922, had wanted a war book but were disappointed; in The Enormous Room he ‘uses war: to explore an inconceivable vastness which is so unbelievably far away that it appears microscopic’. Something ‘more unimaginably huge than the most prodigious of all universes – …The individual.’ This is an account of an individual’s struggle against a callous wartime system. Edward Estlin Cummings was born in Cambridge, Massechussetts in 1894, the son of a Harvard professor who later became a Unitarian minister in Boston. With family friends like Henry James’s philosopher brother William, it was unsurprising that he graduated from Harvard in 1915. In 1917 he enlisted in the Norton-Harjes ambulance corps in France (Hemingway also drove ambulances in WWI). With his friends John Dos Passos and William Slater Brown (known as ‘B’ in this book) he became deeply Francophile, hostile to the bigoted, bellicose attitudes of his superiors, and all three volunteers, especially Brown, expressed in their letters and conversation anti-war sentiments which exhibited a lack of animosity towards the Germans which the military censors considered seditiously suspicious. He and Brown were arrested, cursorily arraigned, and committed to a ‘dépôt de triage’ – a sort of interim jail – at La Ferté-Macé in Normandy for over three months. Here they were incarcerated in the huge cell which gave the book its title. More of a bitter-humorous memoir or journal than novel, The Enormous Room simply relates the events leading up to Cummings’ arrest and imprisonment, and then profiles the brutal, unhygienic regime he endured, with portraits of dozens of the varied inmates with whom he shared this ordeal. Most of them were there simply because they were foreign; in the eyes of the French government, depicted in the book as blinkered by bureaucratic xenophobia and systemic stupidity, this was sufficient grounds to consider them spies. In many ways the book resembles Solzhenitsyn’s blistering account of a Soviet gulag in Ivan Denisovitch, but Cummings imbues his narrative with the irreverent wit of a young American non-conformist adrift in the France he loved for its culture but which was governed and administered by thuggish buffoons – according to this account. A surprising factor is that there are only intermittent signs of the experimental style of his later poetry, with its typographic unorthodoxy and syntactic fluidity; his prose style is curiously stately, even Victorian/Edwardian in its ornateness. At times, in fact, it’s rather too stuffy and decoratively literary, with frequent allusions to Pilgrim’s Progress that clog its workings awkwardly. Between gulps I smelled the bread furtively. It smelled rather much like an old attic in which kites and other toys gradually are forgotten in a gentle darkness. There are a few unfortunate casual racist terms that can probably be ascribed to the intolerant attitudes of the times. Otherwise it’s a deeply humane story of the principled resistance by a young man of deep moral rectitude to the inane and unimaginative prejudices of a corrupt and hopelessly narrow-minded system that was rendered even more stupidly corrupt by war. The need to oppose the enemy encouraged an attitude of self-righteously venomous racism that would be unimaginable today, except it’s still too (sadly) evident. And so on; I find that too polysyllabic and filled with stodgy ‘elegant variation’. But these are minor defects. The Enormous Room was much admired by F. Scott Fitzgerald, and it’s worth reading as a testament to the indomitable human spirit in the face of institutional cruelty, intolerance and hostility to people who dare to flout convention and refuse to conform to the tenets of mediocrity. Rain did, from time to time, not fall: from time to time a sort of unhealthy almost-light leaked from the large uncrisp corpse of the sky, returning for a moment to our view the ruined landscape. From time to time the eye…stopped upon the incredible nearness of the desolate without-motion autumn. I will get upon the soonness of the train and ride into the now of Paris.